One of the most important aspects of shooting an AR-15 or any other rifle is to make sure you hit where you are aiming. Sighting in a rifle is important to anyone serious about getting the most out of her shooting experience. One method of sighting in a rifle is bore sighting. As the name implies, you will looking down the barrel, through the bore, to see your target. 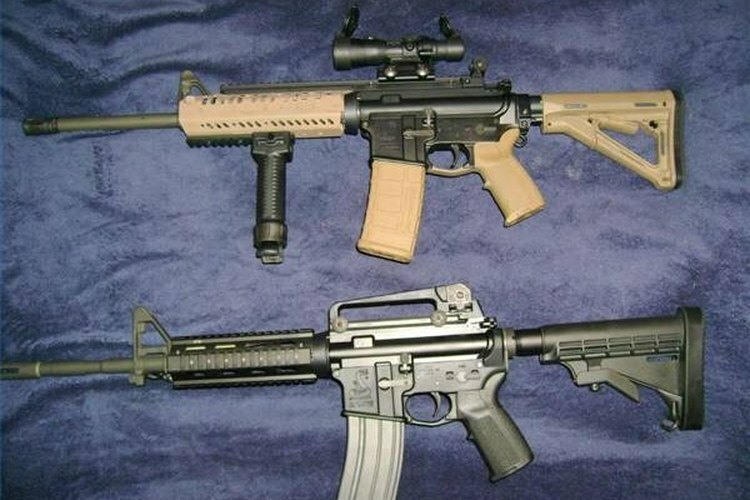 Some rifles, especially auto-loaders such as the AR-15, will require you to remove the bolt from the breech. Another method is to use one of the newer laser sighting cartridges, which can save you a lot of time and is generally a lot easier to do. Although you do not have to go to a shooting range to do this, it is best if you do. This article will tell you how to bore sight an AR-15 or other similar rifle. Set up a table. If you go to a shooting range, most will have gun benches on the rifle range. If you're shooting outdoors elsewhere, you'll need to set up a table that is sturdy enough to shoot from, and grab a chair as well. If you prefer to lay on the ground to shoot, that is fine too. Set up a rest on the table for your rifle. Sandbags work great because they are heavy and will not move around as you shoot. You can also use a gun clamp made specifically for shooting. Most rifle ranges will have sandbags on hand, and you can find them at some sporting goods stores. Worst case, you can always make your own. Set up your target. Usually 100 yards is standard for sighting in a rifle, so set up a target at the 100 yard marker at the range. If you are outside, measure and mark off 100 yards from your shooting spot. Remove the bolt from your rifle. You need to be able to see through the breech and down the full length of the barrel. If you cannot do this with your particular gun, you'll need to use a laser sighting cartridge. Put the gun on the sandbag rest and look down through the barrel so that you can see the target. Make sure the target is centered as close as you can get it to being exactly in the middle of the barrel. If you need to use a laser sighting cartridge instead, read the following step. Insert a laser sighting cartridge into the gun, just as you would with a regular shooting cartridge. Make sure to turn it on before you load it. Then place the rifle on the bench rest. The red dot should line up in the center of your target. Adjust your sights. Once the target is centered by using either the bore or laser, adjust the sights or scope on the rifle accordingly. Make sure the cross-hair is centered right on the target of you are using a scope. Fire some test shots. Usually groups of five shots are used to see where the bullets are hitting. Continue doing this until you're right on target. Try to sight your rifle in on a calm day; wind makes the process more difficult. If you use a laser sighting cartridge, make sure it is the right caliber for your gun, one size does not fit all! Always wear eye and ear protection when shooting. Make sure you know what is behind your targets if shooting outside a designated range.